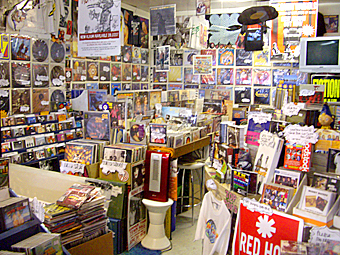 We buy and sell pre-loved CDs, vinyl, DVDs, posters, books, etc. Reload Records moved, lock, stock and two smoking barrels, from the big smoke (Richmond, where we were for 10 great years), down to the seaside at Rosebud (Oh, we do love to be beside the seaside...) We have been here now for over 8 years - woohoo! Reload Records specialise in quality secondhand and new vinyl, CDs and DVDs: contemporary, retro, jazz, blues, R&B soul, electronica, world, roots and soundtracks. All of our secondhand CDs and DVDs are guaranteed. 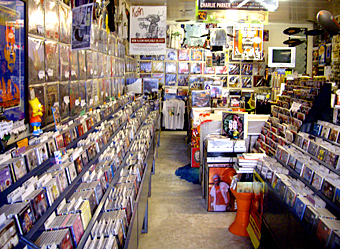 Our shop has been around for 16 years, but Mr Reload has managed or owned 7 record shops and has more than 40 years experience in the music retail, wholesale and record label industry. Any questions or enquiries are welcome. If you have stuff to sell to us, Reload Records are interested in buying your CDs, vinyl, DVDs, music-related books, etcetera, etcetera, etcetera... So email us, give us a call, or pop in to the shop - see our contact info, location and hours below. Reload Records welcome your enquiries about our vinyl, CDs, DVDs, posters, books and more... If there's something you're looking for, let us know and we'll see what we can do for you. Don't forget, we specialise in customer orders - we deal with companies all over the world. For some rare Beatles memorabilia, click here. 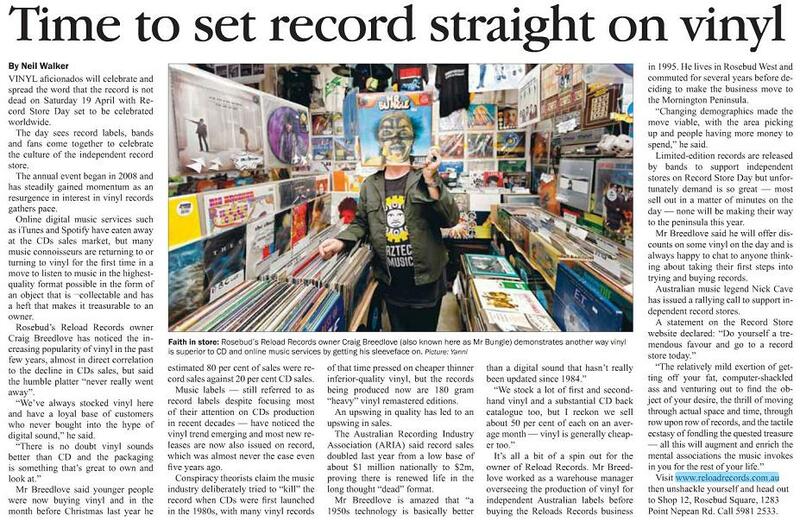 If you do want to buy from us, Reload Records can post items anywhere in Australia or around the world, and we accept many forms of payment. Reload Records vouchers are available - any value, 5 months expiry date. Reload Records also sells on eBay: click here to check out our current auctions, and click here to see our excellent customer service feedback. Reload? refresh, renew, replace, restock, restore, stock up, top up, etc.